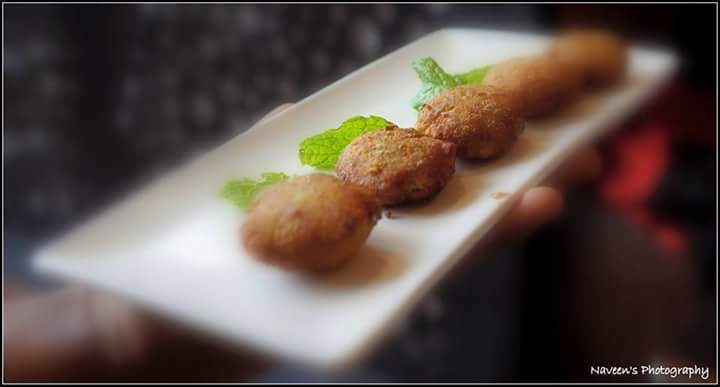 There will be so much of excitement if a new restaurant name is raving on Social Media and even more for a foodie like me and eagerly wait for the weekend to visit! 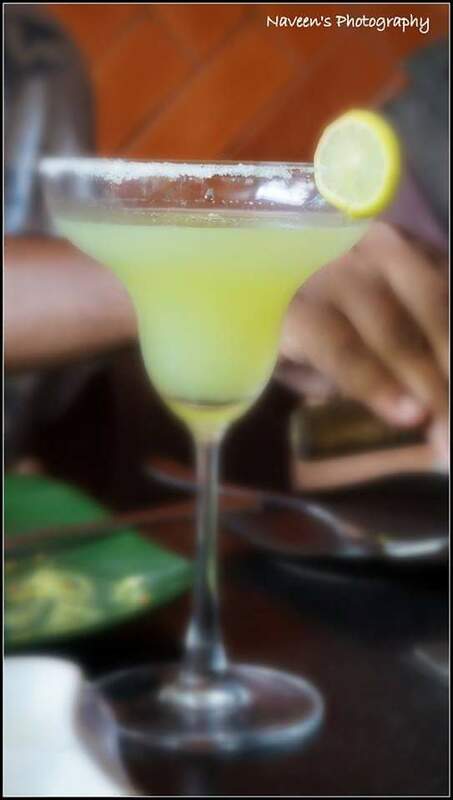 That’s what happened last weekend (11th Day of July) I and some enthusiastic foodie friends made a visit for our lunch to newly opened fine dining restaurant by name “Holy Flames” in Marathhalli, Bangalore. Thank god we dint face much traffic, since it was an afternoon. We dint have much difficulty in finding the restaurant. Holy Flames is part of Cartier Hotel in Varthur Road near Marathhalli and easy to pin-point in left hand side if you are coming from Marathhalli. Restaurant is on the Ground Floor with a capacity of approx. 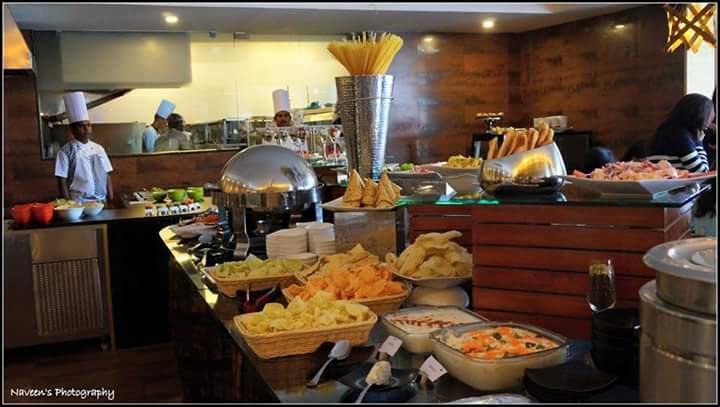 120 and has got wide spread of North Indian, Chinese, Mediterranean and Italian cuisines. 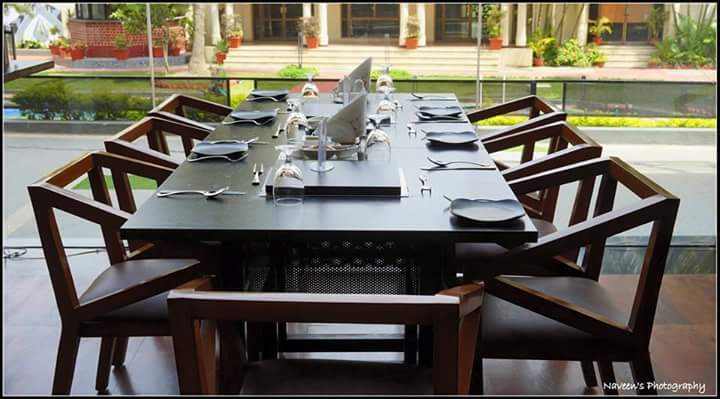 Every table has got Live Barbeque Grills with manifold varieties of Veg & Non Veg dishes. As soon as we sat, beautiful welcome drinks were arrived in a shot glasses, those two were bliss! One was Cranberry based and other one orange I guess. 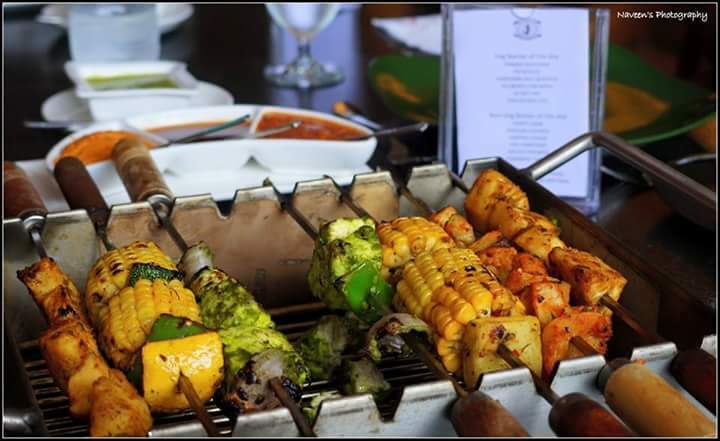 Without wasting time we requested for the Barbeque Grill on our table to enjoy the exotic Barbeques. 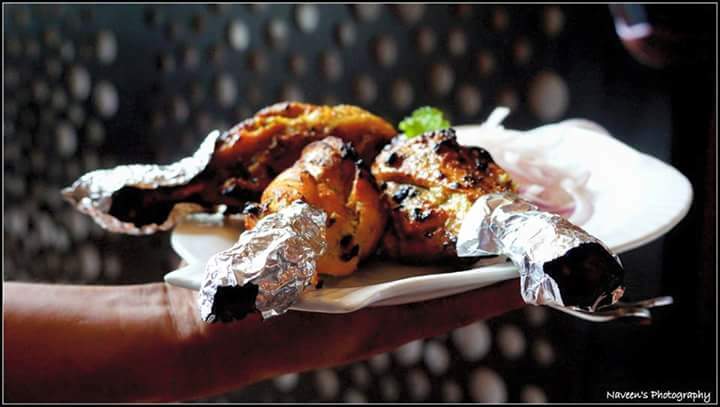 In Veg they served Khandar Paneer, Nazkati Aloo, Tandoori Ananas, Tandoori Fruits and a few others in Barbeque Grills. 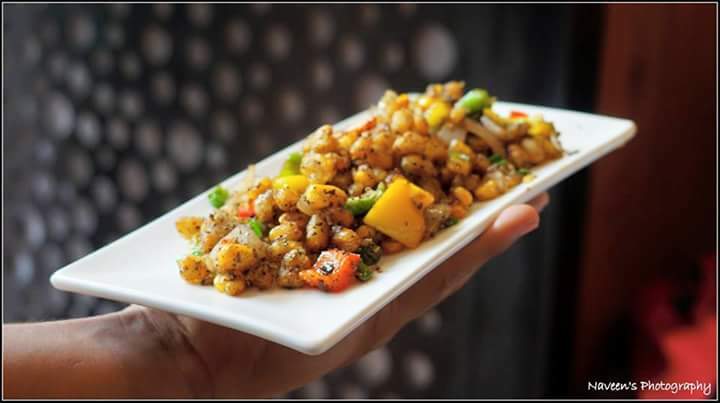 In Off Grills also they served some mouthwatering starters like Potato 65, Salt & Pepper Corn, Jalapeno Fritters and Hara Bara Kebab. 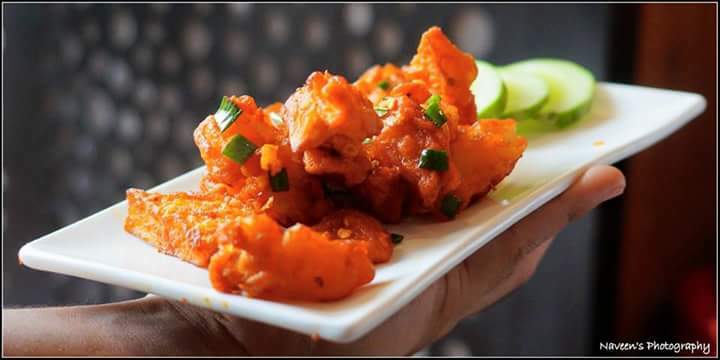 I am totally impressed with all the dishes including On & Off grills except Jalapeno Fritters; I feel its little tangy but goes well with Garlic Mayo Dip! 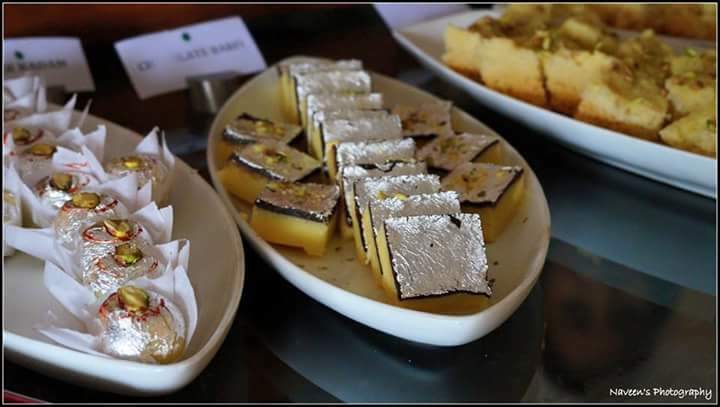 As I mentioned above, they have a wide spread of Salads, Main Course and Desserts in the Buffet section, which is commendable! We were almost filled with Starters, but still we got one plate of all the dishes and shared among. 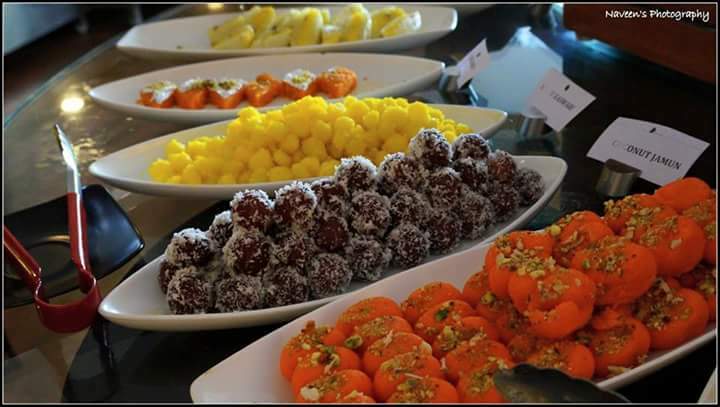 They also have Golgappa, Papdi Chat and Dahi Bada is Chats Section, which gave street food touch to the spread. In Cocktails, I ordered Long Island and Regular Mojito. 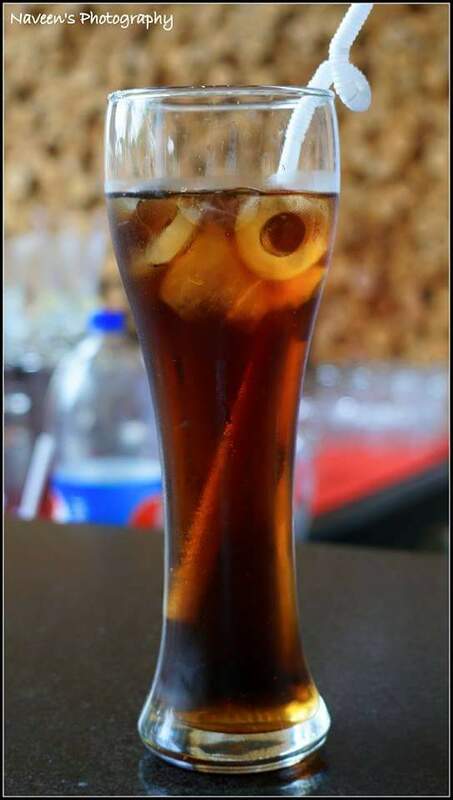 Long Island I tried for the first time, as per one of my foodie friend’s suggestion! Being a light drinker, I somewhat did not like, however the regular Mojito has been just awesome and made perfect by a Bartender. 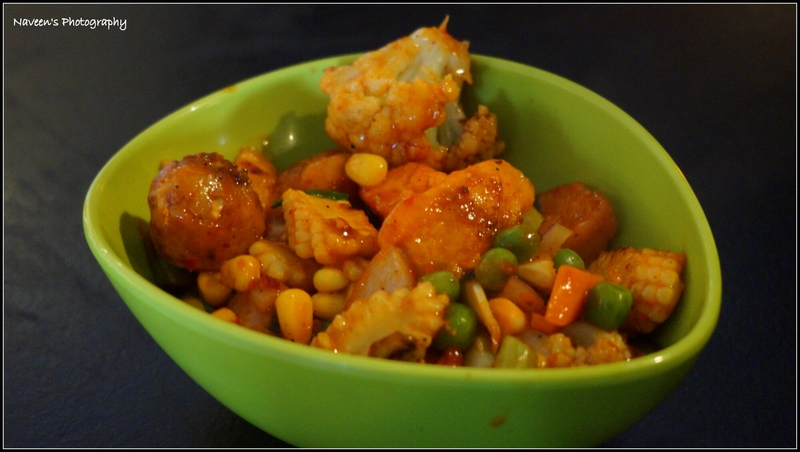 I always love Biryani and unfortunately there was a Corn & Peas Pulao, so I was a bit disappointed. The chef prepared a Veg Biryani for us, that’s entirely impressive and the taste was great though although it is not authentic. There is not be ended if I start talking about Interiors of the place, the ambience is just flabbergasting. The restaurant has got a Rustic decor with beautiful lighting! The Place has natural light. They took pride in having a relaxing ambiance, perfect to complement for lunch or dinner. With a poolside setting, we can flavor virtuous food while reveling in the beauty of the place at Pool Side. 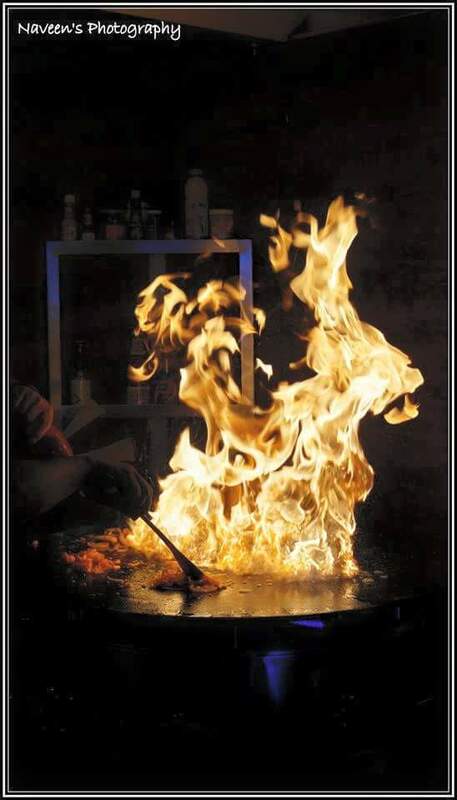 Service is one of the USP’s at Holy Flames, folks here are knowledgeable and they know the essence and capable enough to answer more about the dishes! They were attentive, humble and honest. Holy Flames will be the best competitor in this Segment. 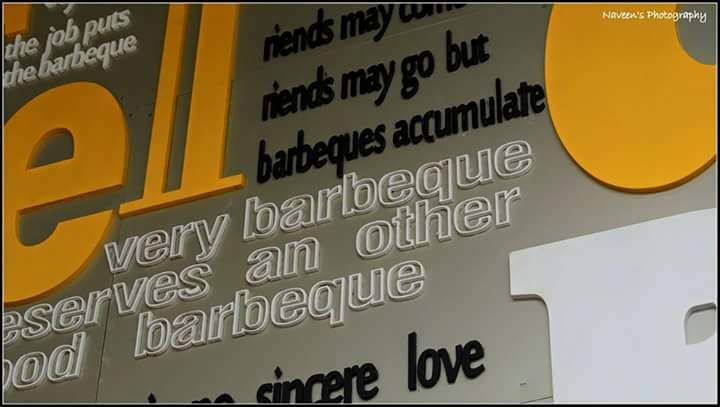 There are so many chains of Barbeque restaurants in Bangalore, but this place is definitely incredible when we compare with Price, quality, service, ambience and Hospitality! 2999 + Taxes for One night stay for a person including Food, Liquor, Night Stay, Pool Access, Gym and Complementary Breakfast. 4999 + Taxes for One night stay for a couple including Food, Liquor, Night Stay, Pool Access, Gym and Complementary Breakfast. Grab this steal before it goes off! After my visit, I happened to visit for a second along with Co-Workers all the way from Electronics city for the second time and they enjoyed the food and time over here. They are bored of traditional barbeque restaurants in Bangalore and Holy Flames had become their favorite one! 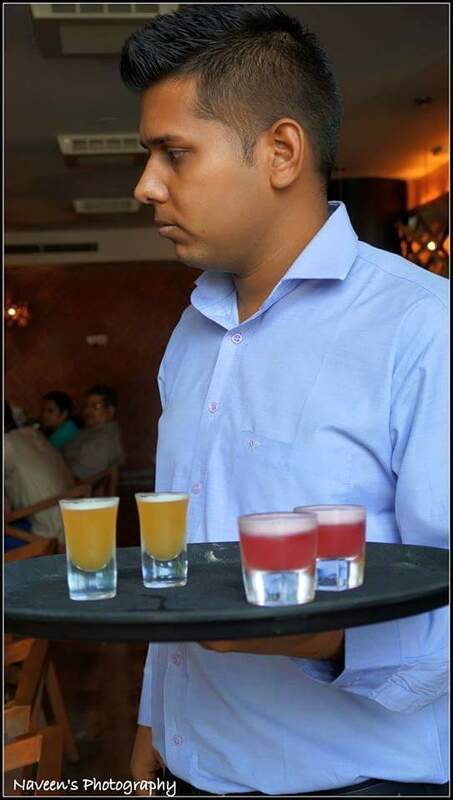 General Manager at Holy Flames has got so many plans to give the best experience to guests, which are unique compared to other restaurants! I personally enjoyed every moment I spend At Holy Flames and I will definitely visit again with Family! Previous Post Food Bloggers Association Bangalore’s 3rd Meetup @ District 6, Malleshwaram, Bengaluru. 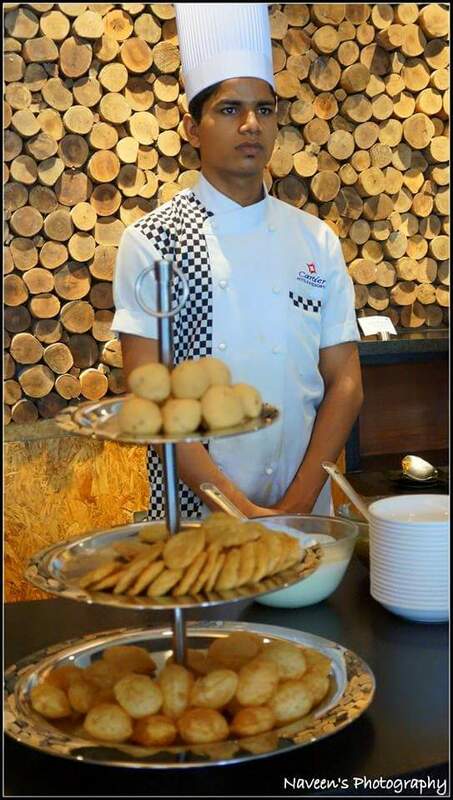 Next Post Dineout Bloggers Meet – Saffron, The Park Plaza, Bengaluru.